Regardless of the price class, Sony always designs its notebooks in an interesting way. 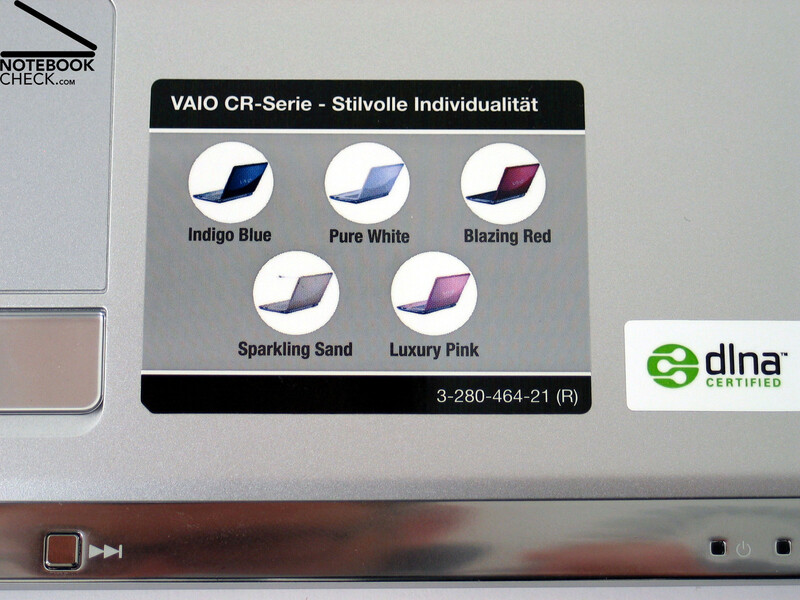 E.g., the Vaio CR21S is currently available in three colors, these are a modest version with silver case and blue lid called 'Indigo Blue', a purely white notebook called 'Pure White' - so to say a notebook in Apple look, and a notebook with somewhat feminine touch alike Paris Hilton, called 'Luxury Pink'. Generally, we liked the reviewed design version with blue lid and silver case. Hereby, the chrome molding around the base unit, which provides some hot keys for launching Mediaplayer functions at the front side, fits very well to the choice of color. However, whenever choosing glossy surfaces, you should consider that they are also relatively sensitive to various traces of use. e.g., smaller scratches. The haptics of the Sony Cr21S is very user-friendly. The flexural rigidity of the base unit is good, however, the top side is partly to pressure sensitive. Furthermore, we detected that the cover of the DVD drive wobbles. On the contrary to the base unit, the flexural rigidity of the Sony CR21S' display is only moderate, still, the lid's resistance against applied forces is good. Both of the hinges appear to be rather small and also in practice you can observe a clear see-saw after adjusting the display's position. Also the big and uneven gaps of their plastic cover do not improve the overall impression we had of the provided opening mechanism. Furthermore, you can clearly hear creaking noises when adapting the display's position. The VGN-CR21S comes without a transport hook. 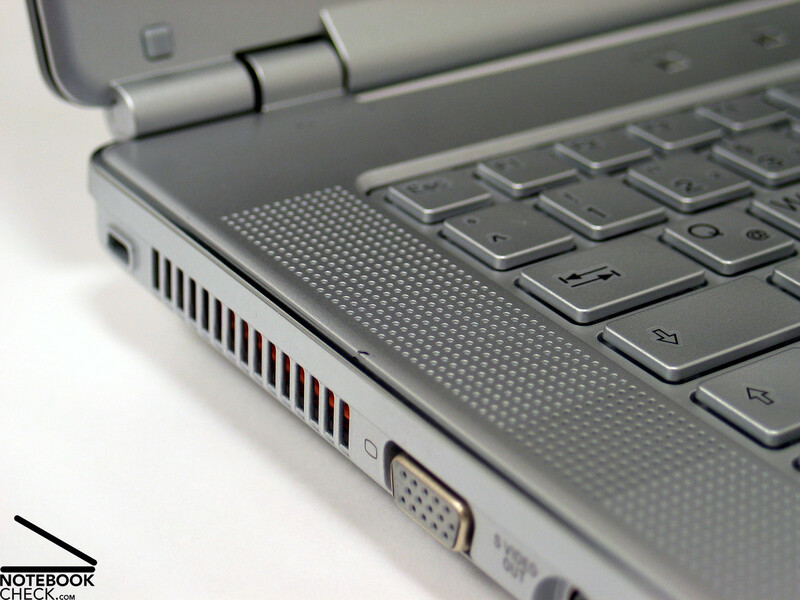 Only a mechanism in the hinges, which draws the lid closed, protects the display against unintended opening. In order to avoid troubles caused by penetrating objects you should, therefore, especially take care, when transporting the notebook. 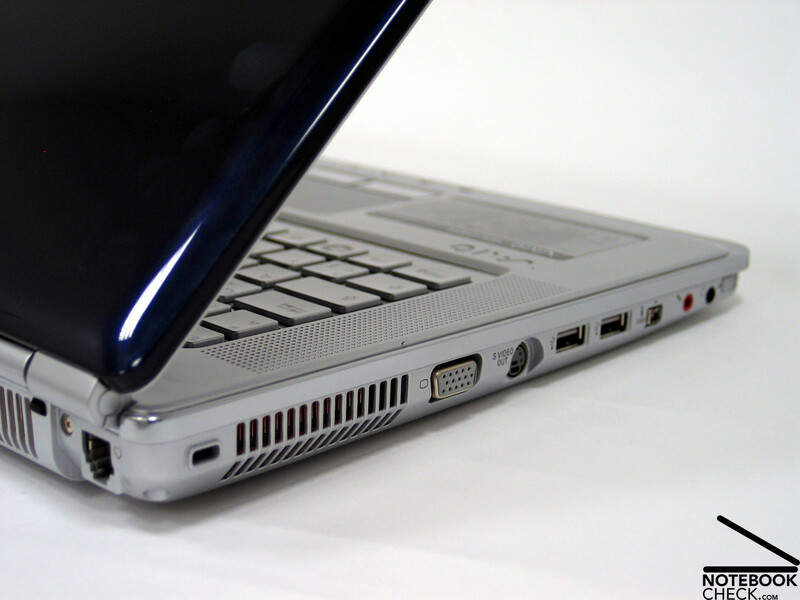 The provided interfaces, which are mostly located a the left side, should be adequate for standard office and multimedia applications. However, a digital optical out, which would also guarantee a high-quality and high-resolution picture on an external display, alike DVI or HDMI is missing. In turn, we were pleased to find a Bluetooth 2.0+EDR provided. 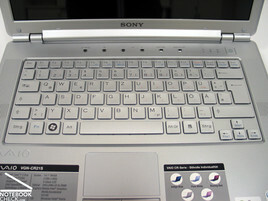 Also regarding this aspect the Sony Vaio CR21S tries to score points by design. The layout of the keyboard, which looks similar to MacBook keyboards, does not only look good, we liked it also in practice. Although the keys appear to be a little smaller than standard, we could hit them without any problems. Generally, typing feels good. Despite of a clear point of pressure, the keys can be softly pushed. However, when typing more forcefully, you can observe that the keyboard partly clearly yields. 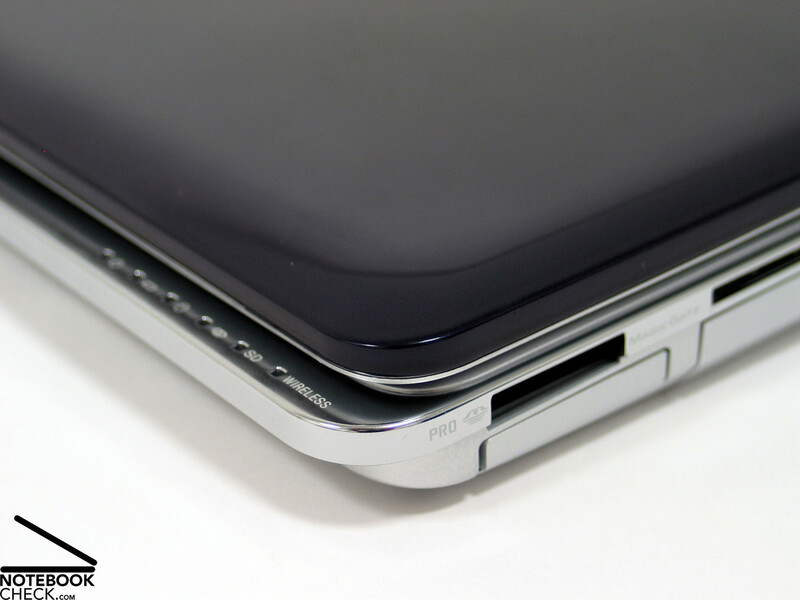 The touchpad is beautifully fit into the case and has two buttons whose surface looks interesting. 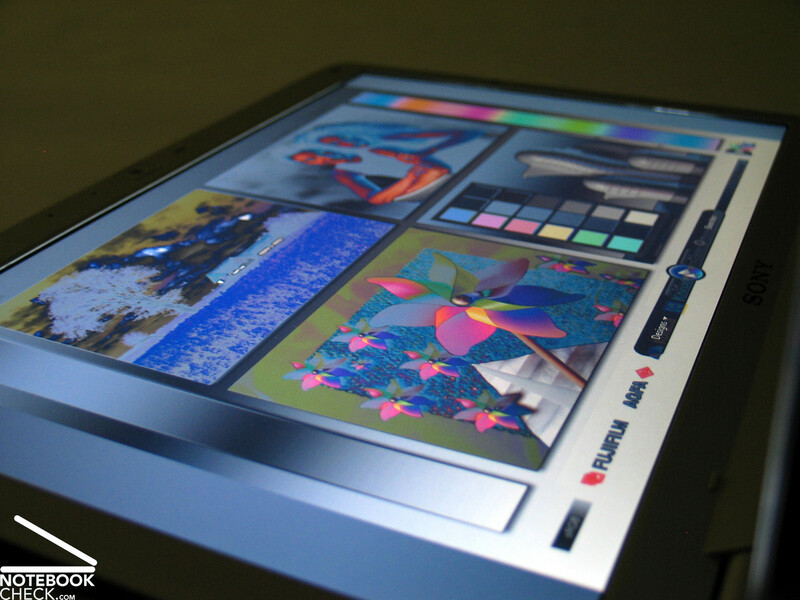 The touchpad works generally alright, though, one needs to apply sufficient force for the buttons to react. Furthermore, the clicking noise of the buttons is relatively loud. 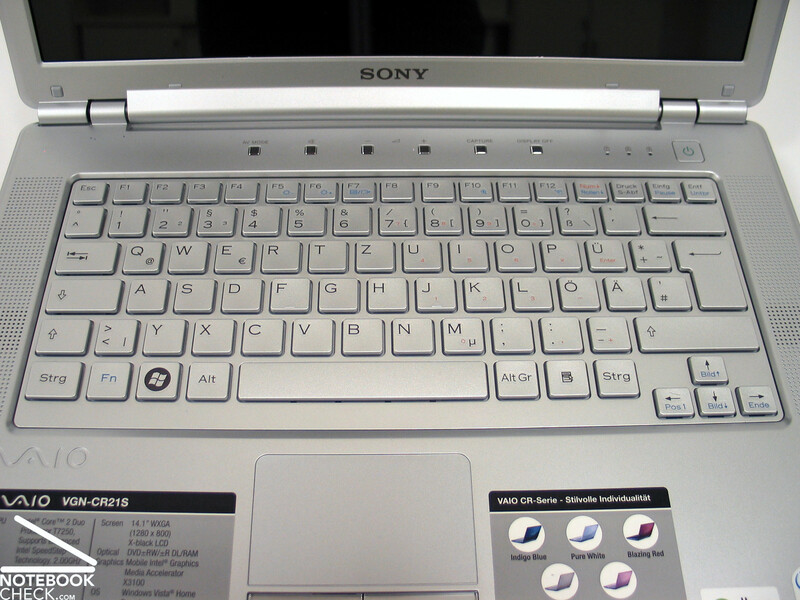 In addition, the Sony Vaio CR21S provides some hot keys for controlling the Mediaplayer at its front edge and some more hot keys above the keyboard, e.g., for volume control. 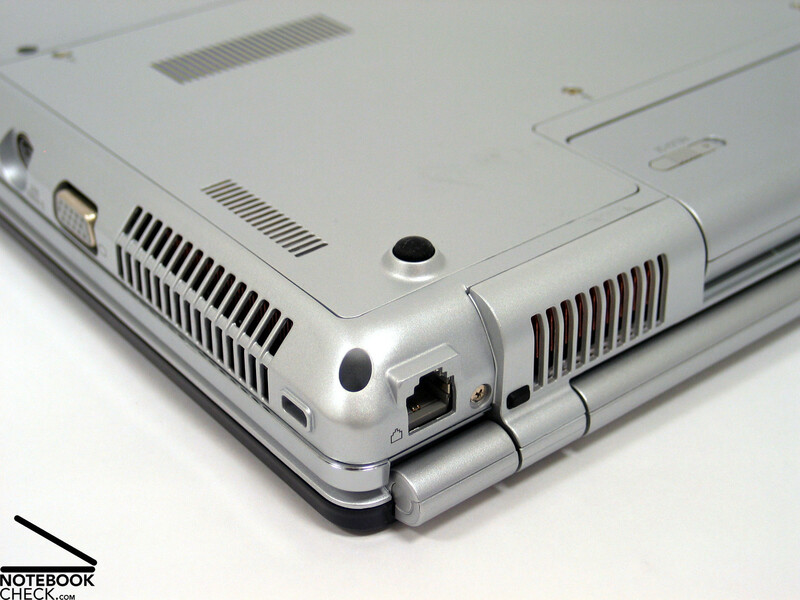 A switch for enabling WLAN is located at the left side of the case near the front. 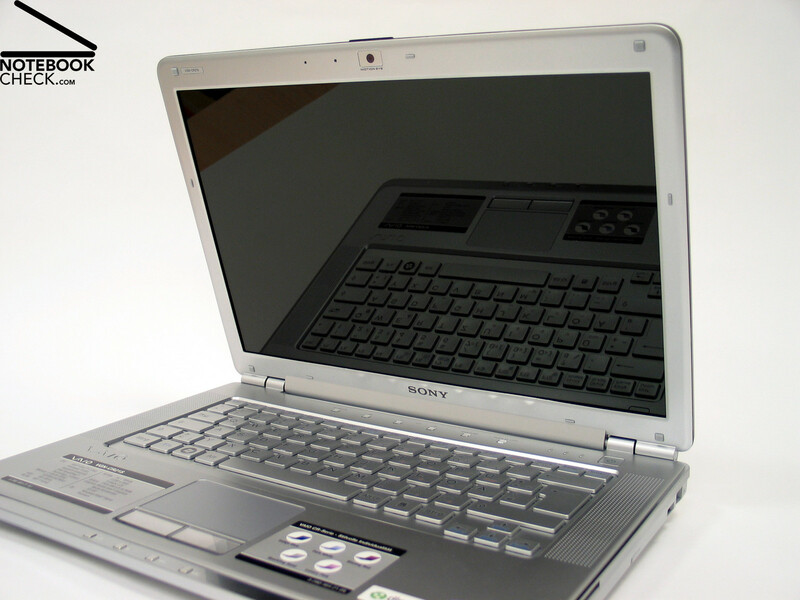 The Sony CR21S comes with a 14 inch wide-screen display with a resolution of 1280x800 pixels (WXGA). So, the desktop size of this rather compact notebook is passable. 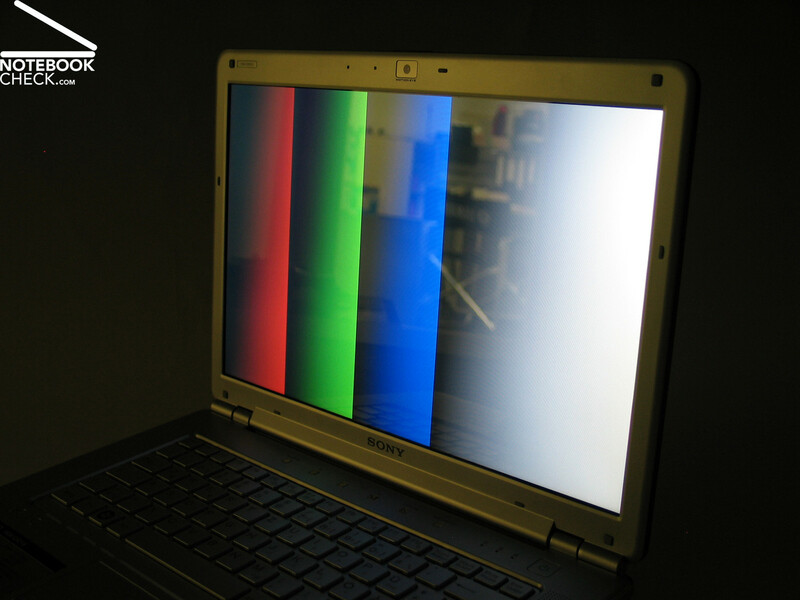 We had the impression that the brightness of the reflecting display was subjectively passable too. We measured a maximum brightness of 176.0 cd/m² in the center of the display. 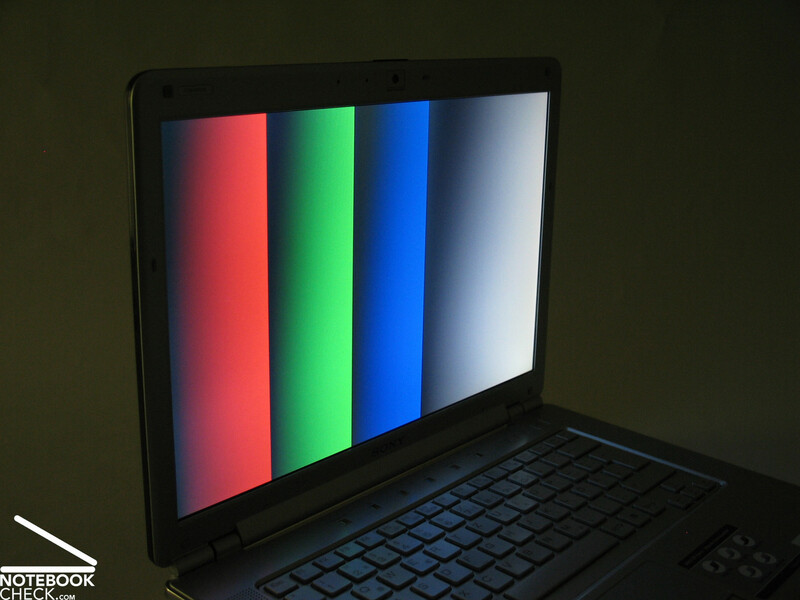 However, because the brightness diminishes in the lower part of the display and amounts only to 128.0 cd/m², the illumination is only 72.7%, which is below-average. 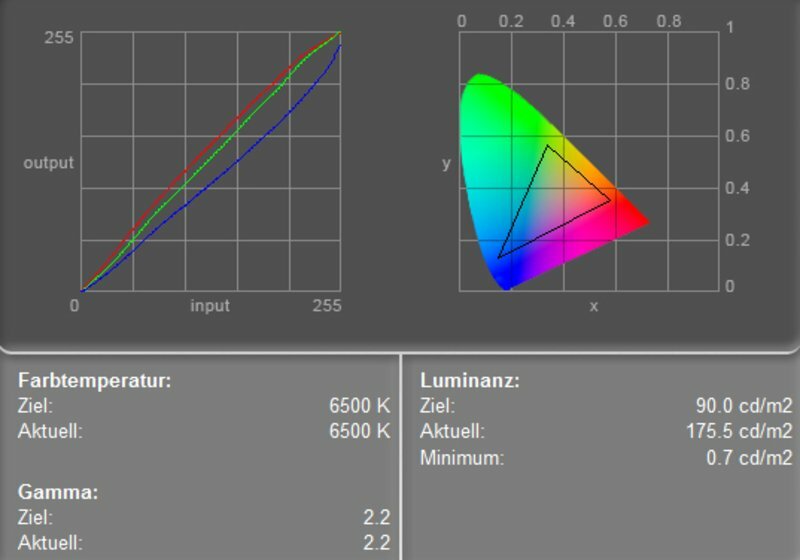 The minimum brightness of 0.7 cd/m² leads together with the maximum measured brightness to a calculated maximum contrast ratio of average 251:1. The notebook not really fit for outdoor usage, and we would not really recommend using it outdoors. 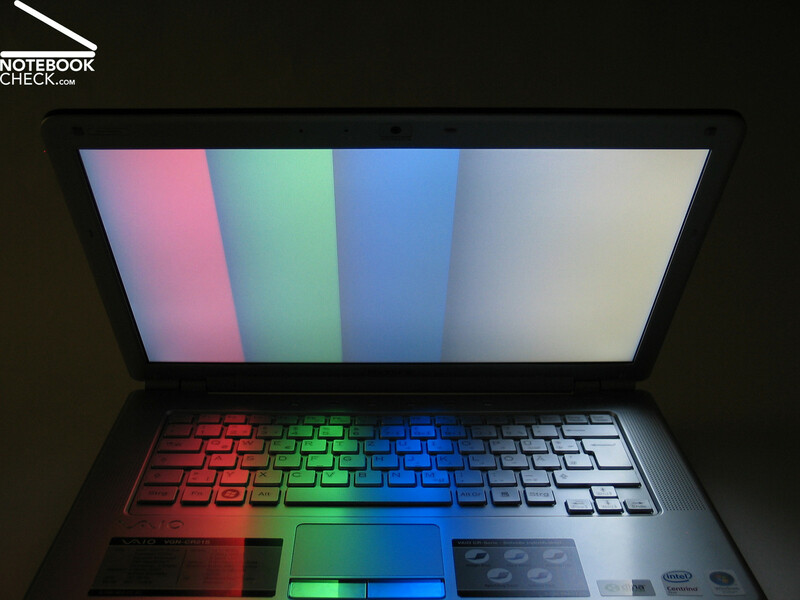 The reflecting display and the moderate brightness and illumination of the display cannot guarantee a well legible picture in bright environments. The viewing angles of the display were not really convincing. Vertically, you'll quickly face a heavy darkening when looking from bottom up and a whitening and heavy reflections at acuter angles when looking from top down. Even horizontally, you can observe a loss of contrast and reflection, if the viewing angles is much smaller than the ideal. Overall, the viewing angles of the display are relatively narrow. So, you'll often need to adjust the opening angle during mobile use. 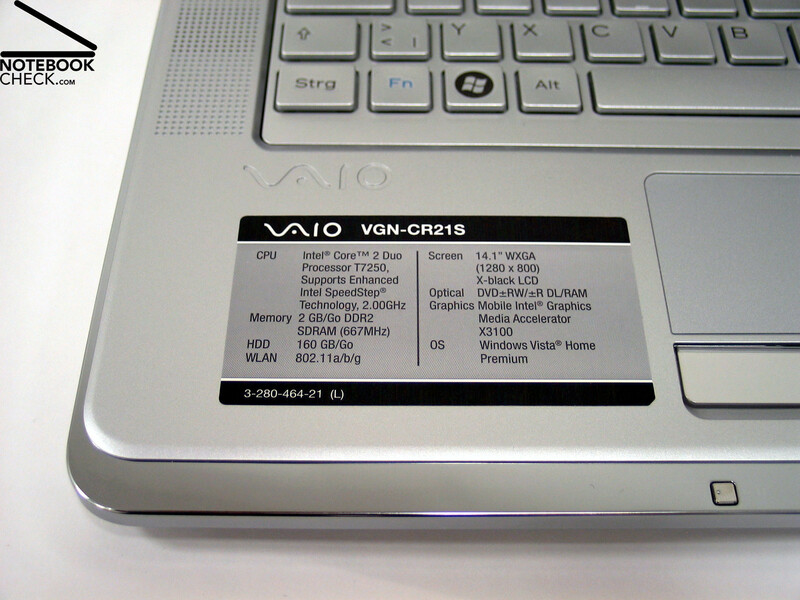 The Vaio CR21S is equipped with an Intel Core 2 Duo T7250 CPU with 2.0 GHz and an integrated video chip by Intel, a Graphics Media Accelerator X3100. 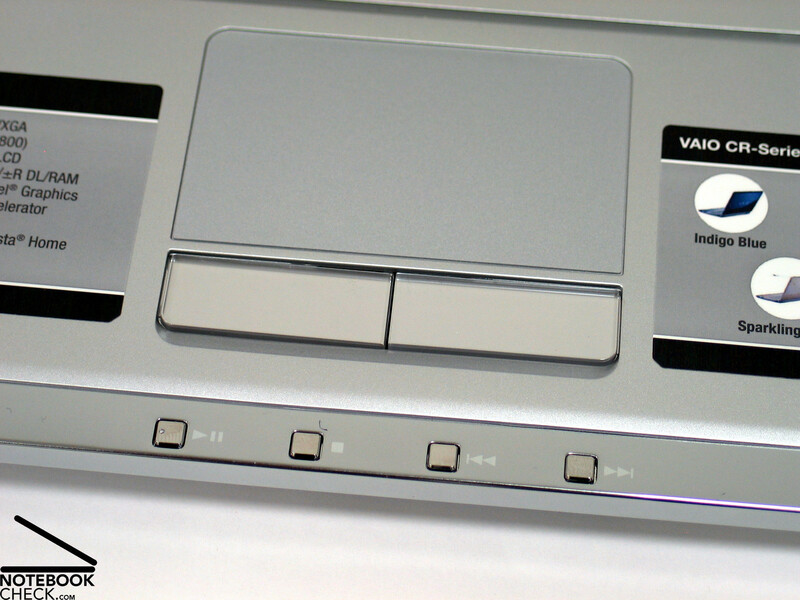 This is a typical office equipment with sufficient reserve capacities for applications like Office, Internet, DVD, etc. 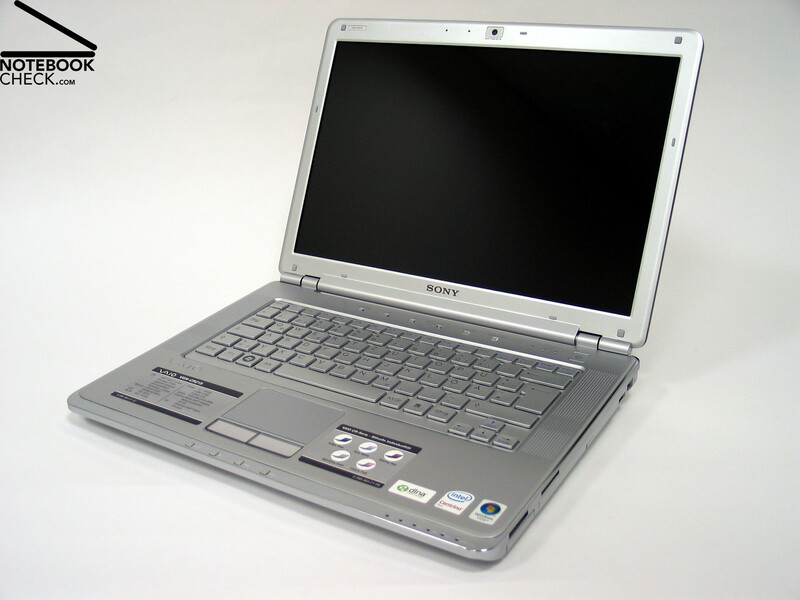 In addition it comes with a 160GB hard disk (5400 revs/min), whose access time and transfer rates are passable and which also provides sufficient capacity for your music and video library. 2 Gigabyte main memory are fortunately already nearly standard and guarantee a smoothly working Windows Vista. 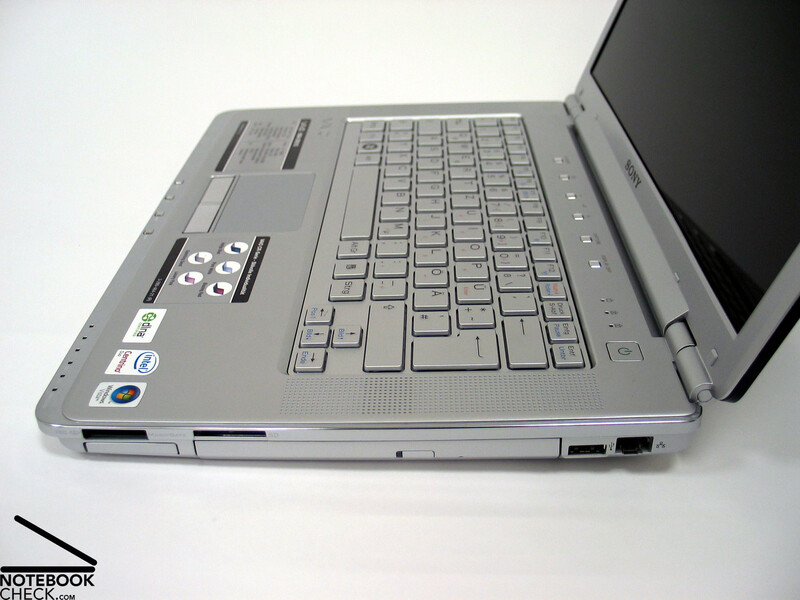 Apropos, Windows Vista Home Premium is already pre-installed on this laptop and after some configurations you can immediately start using the CR21S. 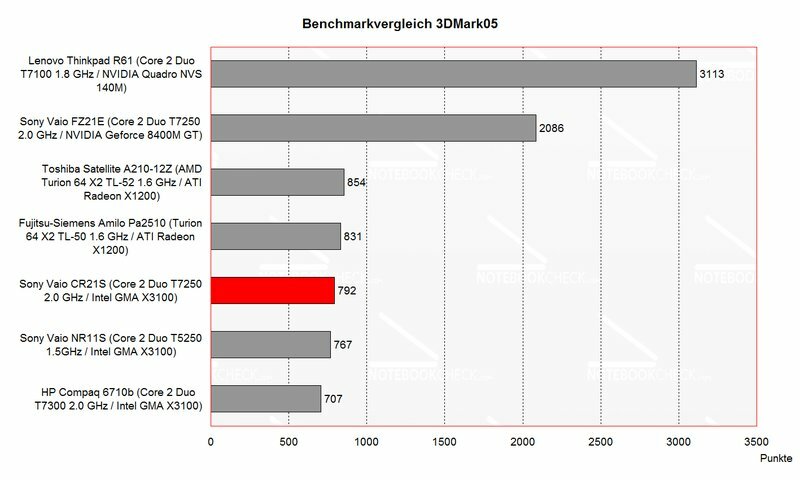 The Vista performance index clearly proves that the video adapter is unambiguously the weak point of this notebook. However, if you do not want to play computer games or demand 3D performance, this should not cause troubles with the above mentioned applications. 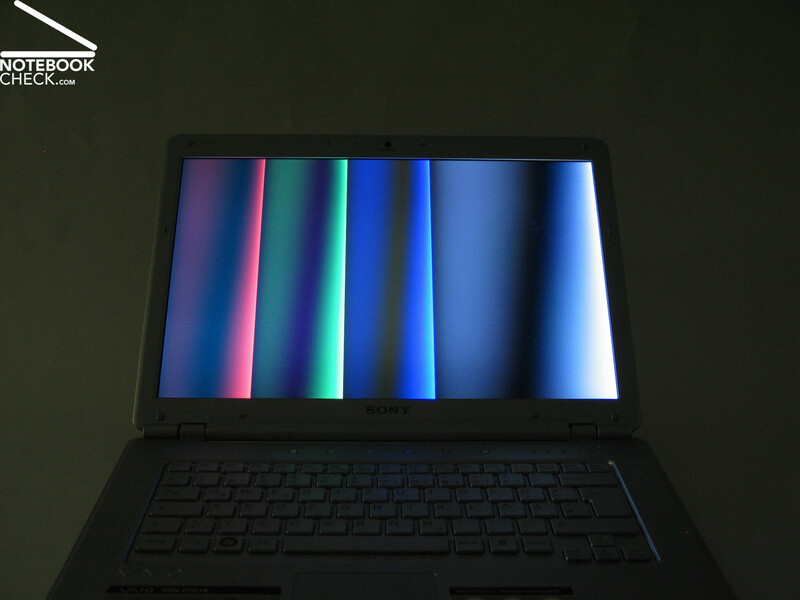 The Aero desktop of Windows Vista (transparent window frames) is even for the X3100 no problem. 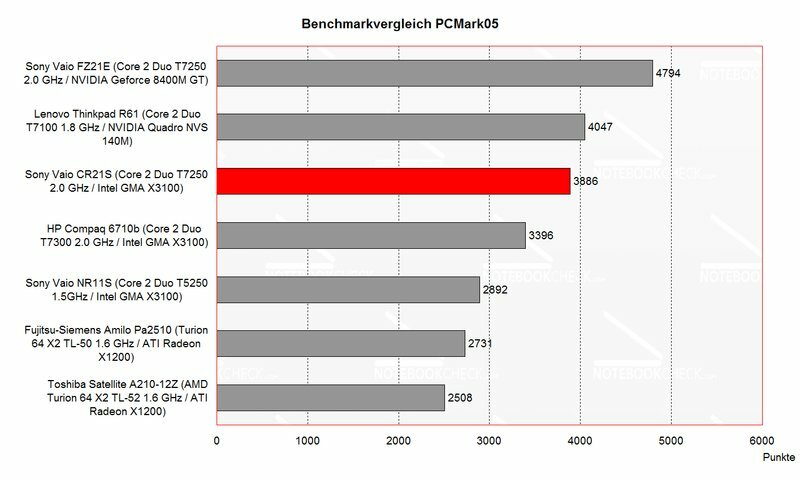 In idle and office mode and also with Internet applications, the fan stayed quiet and hardly audible all the time. Although, you can clearly hear the fan under load, the noise of the CR21S is still far away from disturbing. 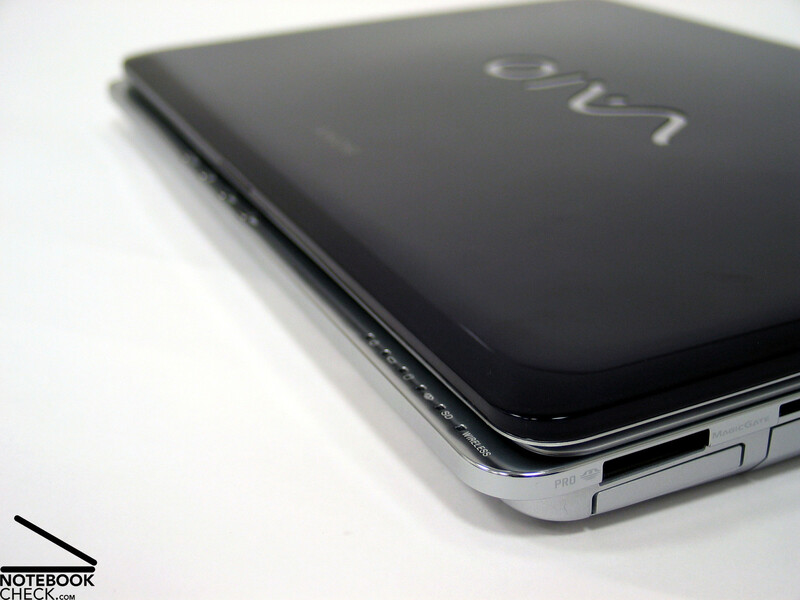 Likewise are the surface temperatures.The bottom and also the top side of the Vaio always stays alright, whereby you can nearly neglect the measured maximum of 35.9°C. (+) The maximum temperature on the upper side is 31.2 °C / 88 F, compared to the average of 33.9 °C / 93 F, ranging from 21.2 to 62.5 °C for the class Office. The sound of the two speakers, located left and right beside the keyboard was surprisingly good. It is impressive and very clear. Because this notebook is not equipped with a subwoofer, the basses are weak, but, music can still be enjoyed with hardly any restrictions. Also the maximum volume was alright. The review proved that the audio out (3.5mm stereo) was also alright. 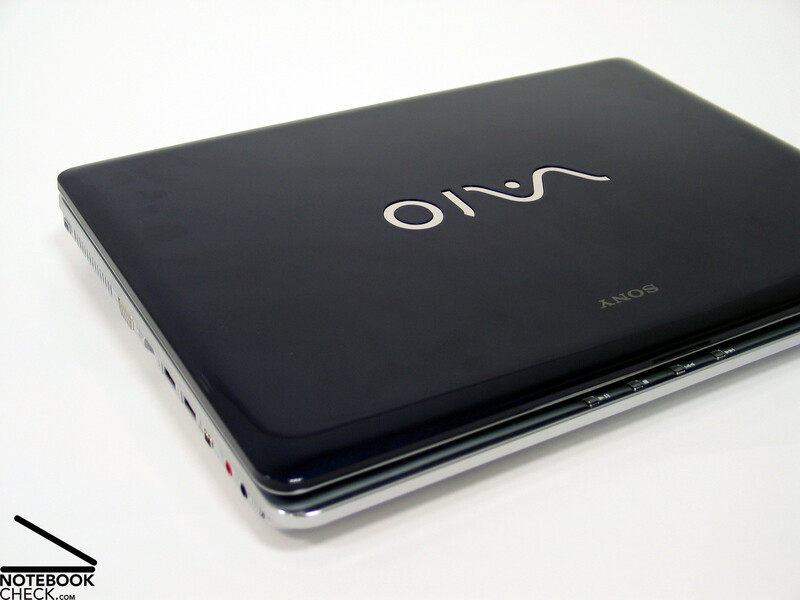 The reviewed Vaio CR21S was equipped with a 4800 mAh or 53Wh lithium ions battery. So, the extrapolated runtime is expected to range from a minimum of about one hour under load to above 5 hours with minimum energy demand. Depending on the demanded performance the practical runtime will be in between this range. 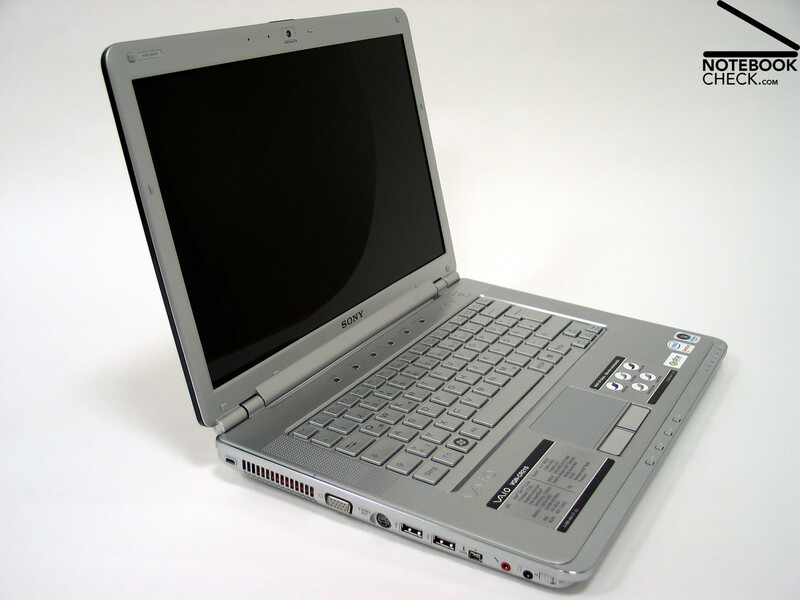 The Sony Vaio CR21S is another elegant Sony notebook, which tries to score points by its attractive look and especially by being available in different designs, i.e., cool blue, Apple white and Barbie pink. Of course also the good price-performance ratio is important for potential buyers. Besides of the interesting look, the case is also sufficiently flexural rigid and stable, although it allows slight deformations under pressure at some parts of the top side. 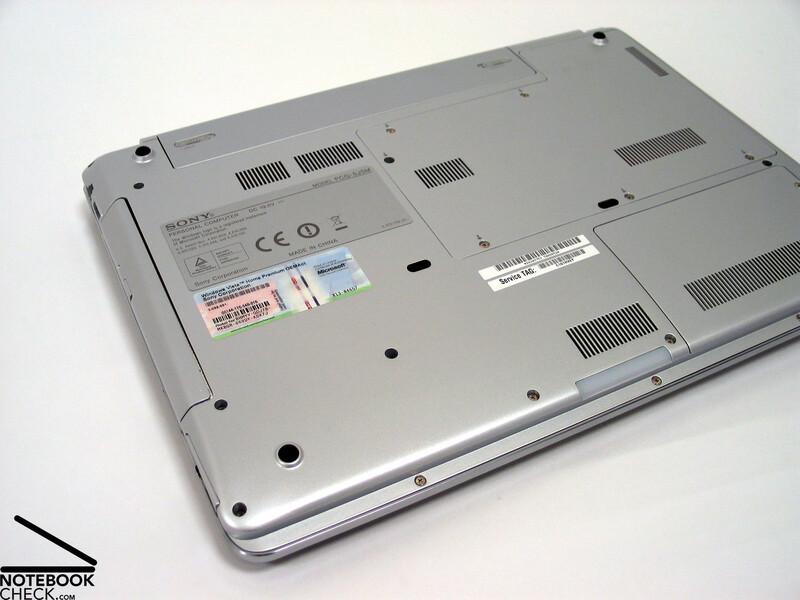 The relatively small hinges could cause some troubles after a while, because they even allow a see-saw after adjusting the display's opening angle of the new notebook. 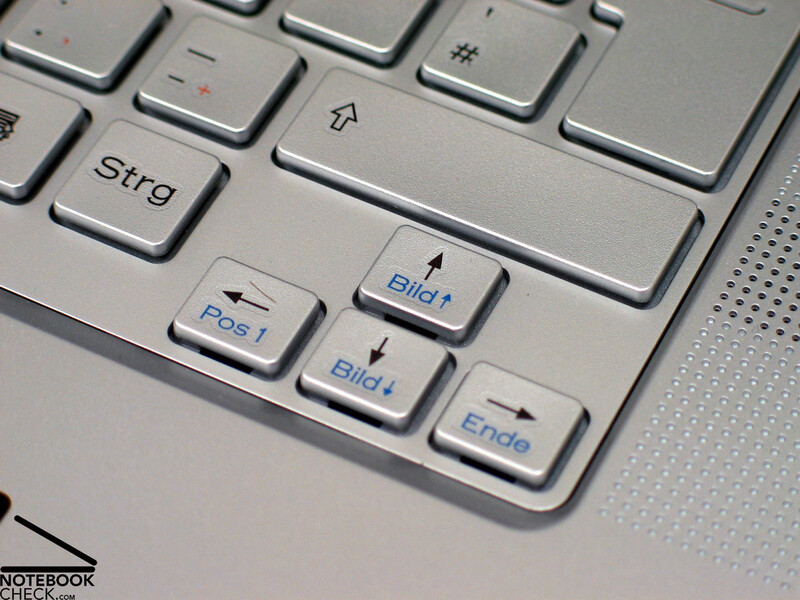 The design of the keyboard is interesting, but, this does not have any impact on user-friendliness. On the contrary, besides of somewhat yielding too much under pressure, typing is really user-friendly. 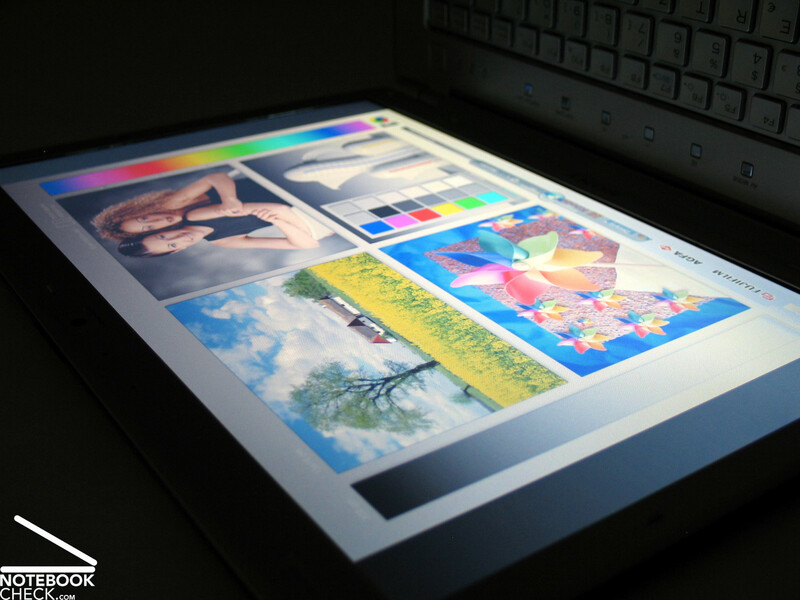 Generally, the brightness of the display is good, but, its illumination and viewing angles are weak points. So, you might possibly need to adjust the opening angle quite often. 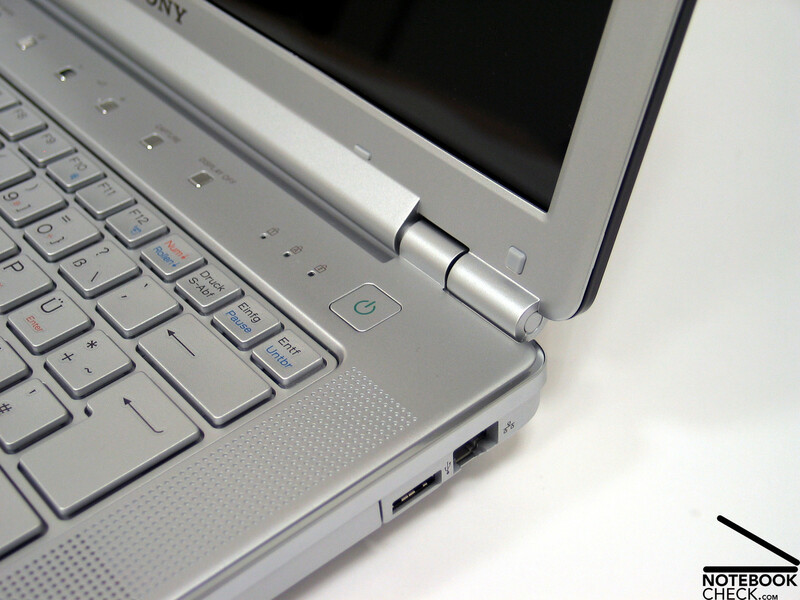 Regarding performance the Sony CR21S is passable equipped for Office applications, i.e., processor performance, main memory and hard disk capacity are alright for standard office and Internet applications. 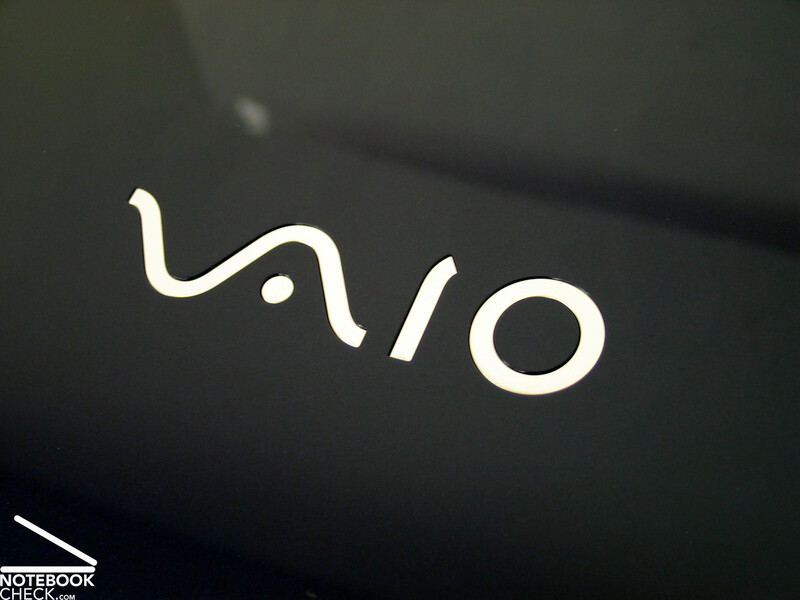 The Sony Vaio CR21S scored points regarding emissions. The low noise emissions and also the low surface temperature cannot be criticized in any way. In addition also the sound of the built-in speakers is good. Finally, also the battery runtime is depending on the planned use moderate up to very good. At minimum energy demand, i.e. least hardware requirements, the CR21S' runtime can yet be some hours. Many thanks to the company MediaMarkt Wels, which kindly provided us with the reviewed notebook. There you can also buy it. Even the sound of the speakers is good. But, also the surface temperatures always stay alright. We were especially pleased by the low noise emissions. A Core 2 Duo CPU and a X3100 video card, both made by Intel, ensure sufficient power for office applications. 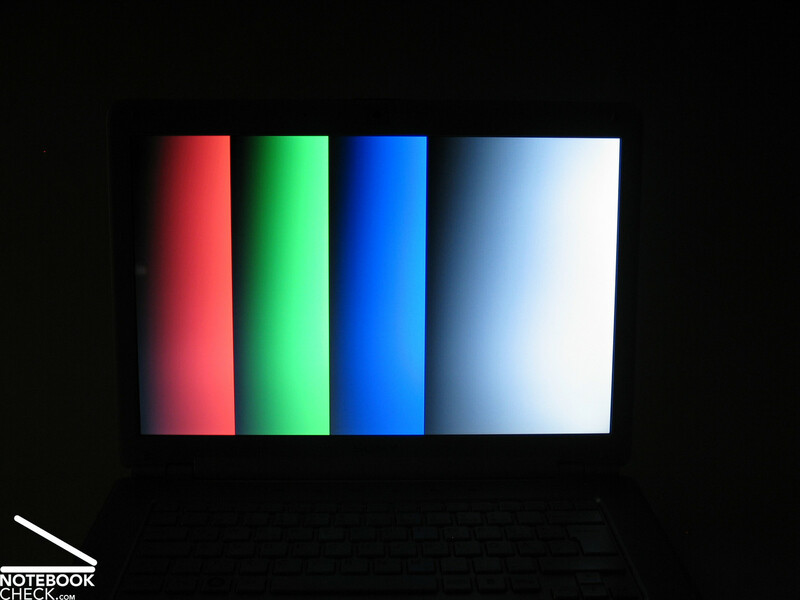 The 14" display is passable bright, but, illumination and viewing angles did not totally convince. The keyboard does not only look good, it is also user-friendly. 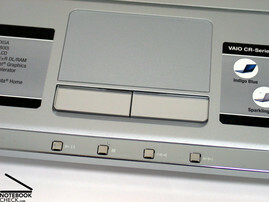 All standard office interfaces are available, besides the unfortunately missing digital video out. ...but, we detected some smaller problems with the hinges. ... a compact 14 inch format. In total there should be 5 different designs of the Sony CR available, among others also a perky pink one. ...of the Sony CR21S with blue lid. 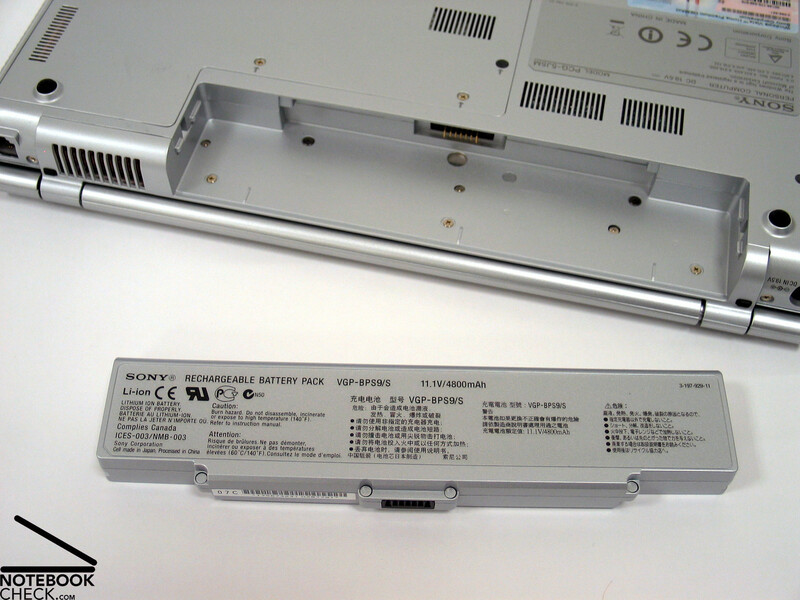 The battery runtime is sufficient for mobile use, as long as you do not demand too much power.